Dallas Goldtooth of the Indigenous Environmental Network voices his opposition to the Dakota Access Pipeline while law enforcement monitors the protest on the street in front of the North Dakota Capitol. Highway Patrol Capt. Bryan Niewind offered him a megaphone to amplify his voice. 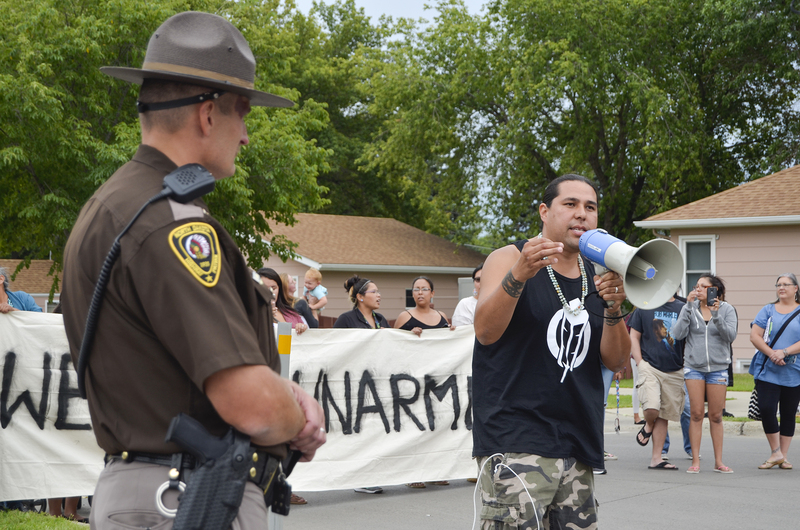 Dallas Goldtooth of the Indigenous Environmental Network voices his opposition to the Dakota Access Pipeline while law enforcement monitors a recent protest on the street in front of the North Dakota Capitol. Highway Patrol Capt. 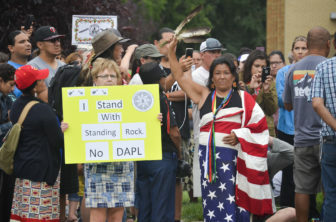 Bryan Niewind, left, offered him a megaphone to amplify his voice. Just 12 years old, Alice Brownotter leads a crowd of hundreds in a rally against a major oil pipeline. She’s protesting the Dakota Access Pipeline, which is slated to cross under the Missouri River, just upstream of her home on the Standing Rock Sioux Reservation in south-central North Dakota. “When it goes through – or if – and when it breaks, it will affect everyone,” Alice said. She’s worried it will leak and poison the drinking water for the 8,000 people living on her reservation. The $3.7-billion pipeline is planned to stretch 1,200 miles from the Bakken oil fields of western North Dakota to Illinois. Dallas-based Energy Transfer Partners is building the pipeline, which has the potential to bring more than half of North Dakota’s daily crude output to the rest of America. State-of-the-art equipment will monitor the pipeline to identify leaks, she said, adding that pipelines like Dakota Access are safer than the alternative. When the oil boom here took off eight years ago, mainly rail and trucks transported crude out of state. Pipelines have since overtaken trains as the leading way to carry oil. Suzanne Kramer-Brenna of Bismarck, N.D., left, stands alongside Tania Aubid of Minnesota’s Mille Lacs Band of Ojibwe at a recent protest against the Dakota Access Pipeline outside the North Dakota Capitol. But opposition to new pipelines like Dakota Access is mounting. Jason Kowalski is the U.S. policy director at 350.org. He says environmental groups are now targeting pipelines because if they aren’t built, fossil fuels can’t get to market. They learned this in their successful fight against Keystone XL – the massive project that promised to bring crude from Canadian tar sands to U.S. refineries. President Barack Obama rejected it last year. Environmental groups like his and the Sierra Club are joining the Native Americans’ fight. So are celebrities like actresses Susan Sarandon and Shailene Woodley, who took part in the protests themselves in Washington, D.C.
It’s a remote part of North Dakota that’s drawing the biggest crowds. Officials estimate 1,500 have set up camp in the grassy fields near the Missouri River construction site. Native Americans are pulling in by the busload from places as far as Alaska and Oklahoma. Jon Eagle Sr., Standing Rock’s historic preservation officer, is one of many there to greet them. The protests forced a halt in construction of the pipeline here last week. The Standing Rock tribe has requested a preliminary injunction to further stop construction. 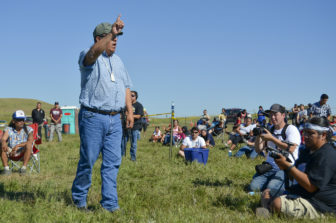 The tribe argues the U.S. Army Corps of Engineers – who approved the pipeline in July – failed to adequately consider the pipeline’s impact on sacred sites. A judge in a U.S. district court heard arguments from both sides on Wednesday. A decision is expected in two weeks. Read Inside Energy’s report on another type of spill that can stem from pipelines: wastewater. Check out this story about private landowners leveraging collective bargaining as pipelines go through their property. Both tribes on Wyoming’s Wind River Reservation have submitted letters of support for the Standing Rock Sioux in the Dakotas as they protest the Dakota Access pipeline.